Cliff Barackman has conveniently placed his video debriefs on a single page. 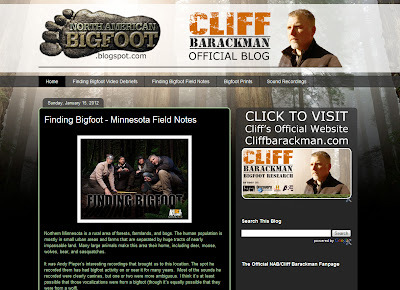 You can watch all of Cliff Barackman's Video Debriefs at NorthAmericanBigfoot.com, the official blog of Cliff Barackman. The most recent video is a debrief of the the Rhode Island episode of Finding Bigfoot. By the way these videos are masterly filmed and edited by Craig Flipy, a true artistic genius. The fun doesn't stop there. All of Cliff Barackman's field notes have been consolidated as well. Don't forget you can check out Cliff Barackman's Bigfoot Prints Database and his sound recordings too.